I love the combination of oatmeal, sourdough, whole wheat (tho in my case it is spelt anyway) and buttermilk. Oats can help lower cholesterol plus because of its high content of complex carbohydrates and water-soluble fibre that encourages slow digestion and stabilizes blood-glucose levels. Buttermilk is a good source of Vitamin B12 and Phosphorus, and a very good source of Riboflavin and Calcium. Mix the flours together with the yeast, oats and salt. Stir the water, buttermilk and butter into the starter. Slowly add the dry ingredients to the starter mixture until a soft dough forms. Let sit 10 minutes. Turn out onto a lightly floured board and knead in additional flour if needed until dough is tacky but not sticky. Knead in the pecans. 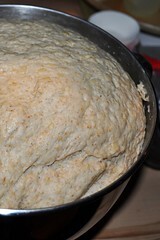 When dough has doubled, turn out onto lightly flour board. Shape into a log and cut into two pieces. Return one piece of the dough to the rising bowl and cover. Shape the second piece of dough on the board into a log and cut into 8 pieces, each about 100 g. Cut each piece in half and shape each piece into a snake and twist two pieces together a a time or two, then place twist on a parchment or silicone mat lined baking sheet. Repeat with remaining 7 (100 g) pieces. You will have eight twists. 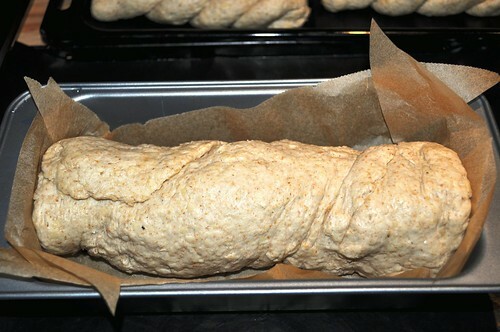 Take the remaining large (about 800 g) piece of dough and repeat the shaping into a log, cutting into 8 pieces, cutting those in half and shaping into twists. You will finish with 16 twists set out on parchment or silicon mat covered baking sheets. Cover twists and let rise until doubled in bulk. 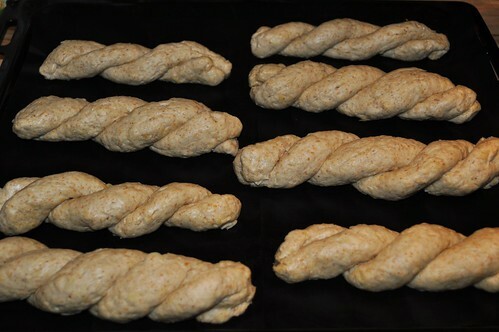 Preheat oven to 400 degrees F when twists are almost doubled. Uncover, glaze with buttermilk with clean pastry brush. If desired sprinkle with finely chopped pecans, or preferred seeds or with sea salt. Bake in preheated oven for 15 minutes. If browning too rapidly, turn down the oven temperature. Turn the pans back to front and bake another 10 - 15 minutes or until breads are 180 degrees inside. Cool on a rack then serve. Beautiful dough! I love the idea of using Nutella on them - delicious! Does this mean that the more oats I add, the more Nutella I can spread on them without worrying about my Cholesterol? Can't wait to bake / eat them. Thanks for the many possibilities you've listed. Great info on the health benefits of these little twists. Your twists are perfect! Some of mine tended to untwist a bit. Love the cute little loaf with the dried fruits and nuts. 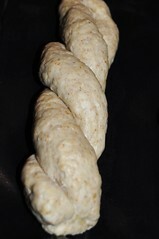 It sure was a lot of dough so I did the same with some of mine, but I must admit I liked the little twists better. Lovely photos Astrid! ... dried sour cherries, cranberries and pecans ... that's a combo I must try! I didn't tell about the loaf I made with this -shame- but the little twists seemed worlds better, nothing really wrong with the loaf it made it just didn't seem as grand as the twists. Your first photo of the twists looks so perfect! mine I would twist and as soon as I laid them down they would take on a twist of their own ... I had no control.